You have to see them live. They have as much fun as the audience. Watch Smitty's face when he plays guitar. They care about their fans. They come out and sign autographs every time. They're not arrogant like other rock stars. They party with their fans. They sound better every time I hear them. I've been a fan since the beginning. Ra still hits those high notes. It makes my jaw drop in awe. 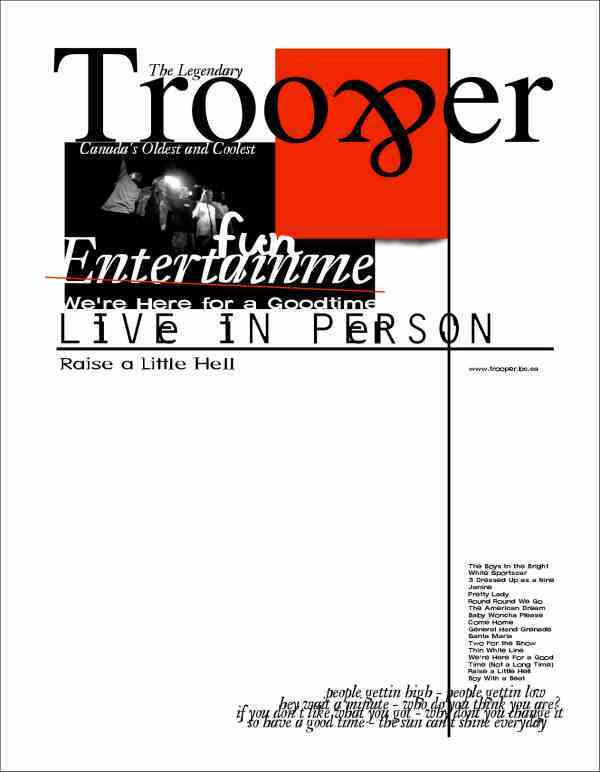 "Trooper" (1975) A great debut with songs like GENERAL HAND GRENADE and BABY WONCHA PLEASE COME HOME. "Knock Em Dead Kid" (1977) One of my favorites with the title song, WE'RE HERE FOR A GOOD TIME, and PRETTY LADY. "Thick as Thieves" (1978) This has RAISE A LITTLE HELL. The best rock song of all time!! "Hot Shots" (1979) The undeniable best rock album in my collection. Every song is great. You can't be a Canadian unless you own this album. It's in our citizenship laws. "Untitled" (1980) Has LEGEND, REAL CANADIANS, and my wife's favorite VOLUNTEER VICTIMS. "Money Talks" (1982) Has the awesome ONLY A FOOL, IT COMES AND IT GOES, and LOOKIN' FOR TROUBLE. This Celebrity Page was made by Tripod member DickJohnson.